The following shapes are NOT sake bottle shape because they are in contact with other stones and/or do not point towards the centre. 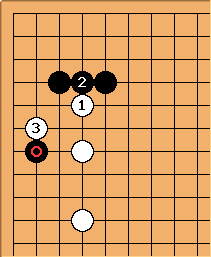 is one of the key points for attack/defense when Black has extensions along the top and left sides. See Reducing an enclosure framework by capping. 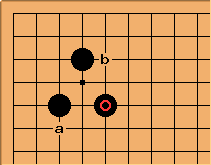 - - are a common continuation after this well-known two-space high pincer joseki. 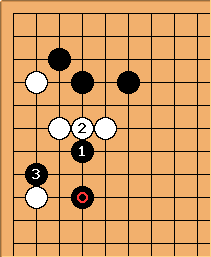 After a typical Chinese opening exchange, Black might try to get under White on the left with .